While we were wrestling with different music ideas for our wedding, we had quickly settled on playing light jazz throughout the reception/evening. We had thought of harpists and other live musicians for our ceremony early on, but had dismissed the idea assuming it to be too expensive for our humble wedding. Now five weeks before the wedding, we have returned to the harpist idea, and found that (for those we checked out) their prices are actually quite reasonable; circling both sides of $300 for playing a ceremony set. Leslie was the first harpist we found online, and the first to call us back. We really enjoyed the layout of her web-site, listening to her many music samples, and pictures of her beautifully carved harp. However, contacting our harpists with only one month before the ceremony revealed its first feared (yet expected) scheduling conflict, so we had to cross Leslie off our "selection list" as quickly as we had started creating it. Anita contacted us next. The layout of her website was also very well done, but the samples were a bit more limited compared to the other sites. What Anita's samples taught us though is that the Paraguayan harp has a distinct sound when compared to "traditional" Concert harps. This difference didn't sound right for us, but I have no doubt others would select it for their various events. While Anita has a page devoted to her Repertoire, I would have appreciated an additional category devoted to grouping together wedding song choices. Like many of the good things in life, saving the best for last lead to Erica's introduction. She also has an easy to navigate web-site, with the only constructive criticisms I have being that her vast Repertoire page would be much easier to read as a bulleted-list then as a paragraph, and I would have loved to see more pictures of her with her harp. One read through her About page though was all one needed to know that they were dealing with a professional of exceptional experience playing the harp; reinforced by listening to her many samples. You just knew that her fingers were gliding confidently and effortlessly across her harp strings. The hardest part now will be picking what songs are played when. Hopefully these links and information are helpful to you if you're seeking a harpist in Winnipeg. I'll make sure I post updates after we have the opportunity to meet Erica in person, and after the wedding ceremony of course. I went to get my suit measurements taken on January 30th after Giovanni confirmed that the fabric we ordered was delivered from Montreal. Two weeks later I receive a voice message that enough of the suit was assembled for the first (rough) fitting; wow, awesome progress! I should have moved quicker when Betty Anne suggested that the glare was pretty bad, but I didn't want to interrupt the master at work as he chalked out the few spots that he wanted to adjust before completing the suits assembly. These aren't the best quality photo's I've posted, but still wanted to share the incredible progress being made. We have been buying gluten free desserts from Goodies for a few years, but had tended to avoid them lately with the switch to Paleo; to keep the sugars and grain flours away. Our thought was to make a Paleo exception for our wedding reception meal and dessert, and our original idea was to order the individual sized desserts from Goodies for each guest and forgo the traditional wedding cake. So we went to Goodies today to order our desserts, and ended up walking out having ordered wedding cakes! What we were surprised about was that the price difference between the individual desserts and wedding cake was really negligible (less than $50). We liked the new trend of not layering the tiers to make one big cake, but rather staging them individually on the cake table. The image on the left represents the basic style that the cake will be decorated with; except that all of the chocolate shavings/logs will be purple. The image on the right is shown just to illustrate what I meant by making tiers on the cake table. My Maxx Collectibles order arrived today, and I figure that means I've recommitted to an old hobby (on hold of course until after the wedding and honeymoon). I used to really enjoy assembling, painting, and playing with my Warhammer Fantasy Undead army; but it took the nudging of an old friend and work colleague to re-kindle and solidify these memories, which lead to picking up the Warhammer 40K Necron army shown below. I also added some Dollarama shopping for paints and glue, hit Canadian Tire for the primer and putty (green stuff), Walmart for a cheap plastic table I can mess up all I want during painting and assembly, and Fabricland for a self-healing cutting mat. What a great way to spend some birthday money! Knowing that we were going to receive our wedding pictures from the photographer (Anders with Valhalla Studio) on Sunday (yesterday), we had popped into Michaels the day before to look at some frame options to bring together the matte we had our guests sign as our "registry" with our favorite wedding photo. As luck would have it, Michaels has a sale going on until this Thur on their custom framing. Because of the "collection" we picked from, the sale kicked in at 70% off! The advice given to us from Johanna (wonderful Michaels' employee) was to bring in the photo and matte together before deciding on a frame and completing the transaction. Anders took almost 900 digital pictures (3.9 GB) of our wedding which he supplied burned onto DVD media. We had a tonne of fun working through them on Sunday, picking our favorites to print for ourselves, our wedding party, parents, and as an insert to our thank you's. Today, we took a USB with our digitals to the Costco Photo Centre for printing. Sizes we printed ranged from 4x6 to 12x18, and the pricing was incredible! The only lesson learned here was that the ordering kiosk slurps in all the photos (from all subfolders), so don't use folders/directories as your sorting mechanism for what sizes you need to print; as the folder names will not be displayed. I had to run back home to write out a paper list of the image names, sizes and counts; which also made a great checklist as we printed over 80 photos. We returned to Michaels with our 12x18 print and matte, lined it up with our 5 previous frame selections, and the obvious choice simply jumped up above the rest. Johanna's advice was bang on! We picked the top frame from the picture below. Now that all the initial printing is done we can complete our Thank You's as our next task. As part of my wife's Birthday this year (she's born on Christmas Day) I decided to take her out for diner and a movie. We first stopped of at Tony Roma's and had a fantastic meal; they really worked hard to try put something Paleo together for us! 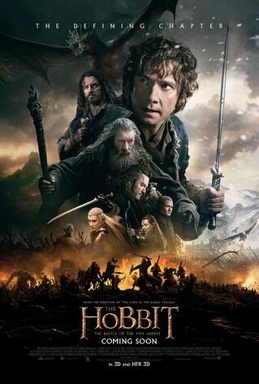 The movie playing this evening was the The Hobbit: The Battle of the Five Armies in 3D. I haven't been to many 3D movies, and can say that I did enjoy the extra dimension overall. My wife had hoped to see more movie about Smaug, so was rather disappointed with how quickly into the movie he exited. Dragon's aside, we did enjoy the story and were very entertained by the final chapter. What are you thankful for this Christmas Eve?